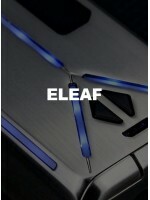 Eleaf iTAP Pod SystemThe iTap from Eleaf is a portable pod system device which boasts innovative dry..
Eleaf HW-N2 5pk CoilsThe latest HW-N2 0.2ohm Head features an innovative Leakage-Proof & Self-Cl..
Eleaf HW-M2 5pk CoilsThe latest HW-M2 0.2ohm Head features an innovative Leakage-Proof & Self-Cl..
Eleaf ELVEN 4pk Replacement PodsReplacement pods for the ELVEN Pod Kit by Eleaf. These pods feature ..
Eleaf iStick NOWOS Kit w/ ELLO Duro Tank Introducing the new legend of the vaping world. Eleaf ..
Eleaf iWũ 5pk Pods The replacement pods for the Eleaf iWũ boasts an innovative and leakage-free..
Eleaf iWũ Pod KITThe new iWũ is a sleekly designed refillable pod system, from Eleaf, with a protect..
Eleaf iJust 3 Acrylic Edition KitThe iJust 3 Acrylic Edition Kit, a new upgraded version of iJust se..
Eleaf Pico Squeeze 2 KIT w/ Coral 2 TankThe Pico Squeeze 2 with Coral 2 Tank by Eleaf, an upgraded v..
Eleaf iJUST 3 World Cup Edition KIT w/ ELLO Duro TankThe iJust 3 World Cup Edition Kit, a new upgrad..
Eleaf iStick Pico BabyExtraordinarily Small and Ultra PortableThe iStick Pico Baby kit is an extraor..
Eleaf iStick Pico RESIN with MELO 4This new iStick Pico Resin features all-new re-imagined Net and M..
Eleaf iJust NexGen KITThe new iJust NexGen by Eleaf not only comes with the well-made HW coils that ..
Eleaf HW-N 5pk CoilsEleaf HW-N 0.2ohm Head features a new net coil technology, presenting an ultra f..
Eleaf HW-M 5pk CoilsEleaf HW-M 0.15ohm Head features a new net coil technology, presenting an ultra ..
Eleaf iJust 3 KitThe iJust 3 Kit with ELLO Duro Tank, a new upgraded version of iJust series&nb..
Eleaf GS Air Series 5pk Atomizer HeadsA new atomizer head of 0.75ohm with pure cotton wick is added ..
Eleaf iSTICK KIYA Kit with GS JuniLess is more! The new iStick Kiya comes with remarkably small dime..
Eleaf iCare 2 Cartridges (SINGLE)***DOES NOT INCLUDE MOUTHPIECE***The Eleaf iCare 2 Cartridge, desig..
Eleaf IC 1.3 Ohm 5 Pack CoilsEleaf engineered a new atomizer head named IC 1.3 Ohm head for iCare se..
Eleaf EC2 5pk CoilsBased on the popular EC coils, an upgraded EC2 series coil is introduced to this ..
Eleaf HW 5 Pack CoilsThe Eleaf HW series Replacement Coils are high performance atomizers designed f..
Eleaf iStick Pico RESIN MODThis new RESIN style iStick Pico features a durable resin encasement of l..
Eleaf iCare SoloTiny yet cute looking, the iCare Solo is a new starter kit with an internal tank by ..
Eleaf iCare Mini Kit w/PCCiCare Mini is even tinier than the original iCare while still retaining th..